Photo of Venus over a frozen lake. 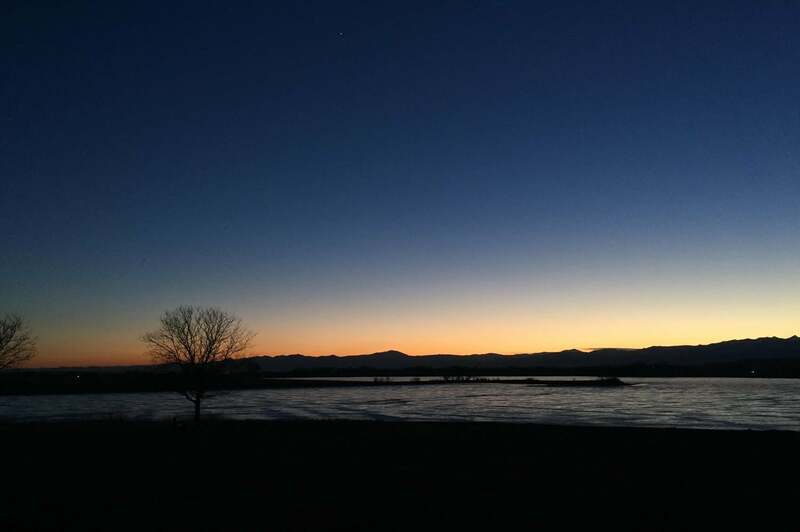 Venus (upper left) over a frozen Colorado lake. The dark spots barely visible over the tree on the left is a flock of geese a few hundred meters away. Apropos of nothing, last night I took this picture just after sunset. The sky was still bright enough to illuminate the lake at a low angle, accentuating the ripples and color variations of the thin ice covering the liquid below… but also dark enough that brilliant Venus was easily visible, dominating the sky to the south. Yesterday was an irritating day for a number of reasons; everything I was doing seemed to get bollixed and impeded by trivialities. It was nothing major, but enough to be frustrating and put me in a dim mood. But then I saw this. It certainly didn’t fix any of the issues of the day, but it just as certainly put them in their place. Venus orbits closer to the Sun than we do, and due to the sometimes non-intuitive dance of the planets, currently appears to be moving away from the Sun in the sky. That will change on Jan. 12, when it reaches maximum elongation from the Sun. From that point forward it appears to change direction, moving from east to west, and once again will slowly move toward the Sun in the sky. Slowly at first, that is; as it gets closer to Earth its speed will appear to increase, and it will close the distance to the Sun rapidly toward the end of February and into March. After that, it will be too close to the Sun to see, being at what we call inferior conjunction. All this is due to Venus moving around the Sun at the same time the Earth does; our constantly evolving view provides endless spectacle. Right now, as Venus swings around its orbit and cuts across the sky, it gets physically closer to Earth and appears bigger. It simultaneously becomes a thinner and thinner crescent, getting very bright indeed. If you think it’s bright now, it will be 50 percent brighter in late March, though close enough to the Sun that it may still be difficult to see. If you have a telescope or binoculars, the next few weeks will be quite a show for our sister planet. Now I’ll let you in on a secret: I’m writing this last night. That is, as you read this on Saturday morning, Dec. 24, I’ll have written this article the night before, and just have taken the photo above an hour or so ago. So here, when you read “yesterday”, I’m experiencing “today”. And although today/yesterday was something of an irritating experience, I feel much better now. Why? Is it because I saw such beauty in the sky, or because I get to share all this with you, and complement it with science?